Let us source and organize your night through our Database of Professional Acts, contact us and we will turn your function ideas into reality. If we can't source what you want we will tell you! We are a no-nonsense service, so feel free to contact us with your inquiries as we are happy to help in any way without pressure, but like any business when booking and placing an Act, this will incur a booking fee. Generally this fee is already accounted for in the full cost of the Act leaving you the client no surprise of additional costs. 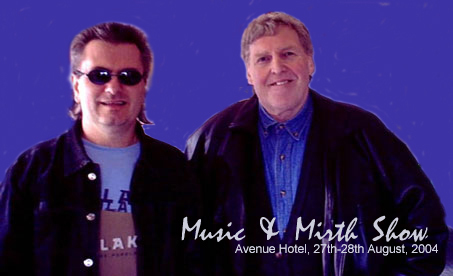 The Music and Mirth Show is a two man team consisting of North England comedian Bobby Gee and New Zealand musician Mark Wenski nicknamed Marc Solo as the music soloist for the show. Originally from England Bob honed his craft as a comedian through the North England clubs with great Entertainers such as Les Dawson and Tommy Cooper and finally in the early seventies settled down - under with his family. Not stopping in NZ, he appears for corporate events, clubs etc. and of course is known through out the clubs as Chairman for the successful Wheeltappers & Shunters Show and of course the Music & Mirth Show. A seasoned professional musician who has been playing since the mid seventies in bands such as Topaz - Russia - Bad Penny - Niteshift to name a few. Still appearing at corporate functions, clubs etc., Marc is an accomplished acoustic & electric guitarist - singer - music programmer who will set the mood for some great laughs with Bob. First choice for 16 years with clients of Aucklands Cruise Company Nicks Cruises and Sallys Events. Now if you are looking for added variety on the music side for the night, for a slight adjustment to the fee we are happy to introduce a Female guest singer to add that other dimension to the music. This combination will get that dance floor moving for the end of the night Party! With Bob recently back from his summer season in Manchester, Bob and Marc are ready to take selected bookings. wants you to smile too!